Mrs. Kader took part in the conference "The new phenomena of armed radicalism, the use of web and strategies to combat it"
Yesterday, the High Representative Mrs. Rezan Kader participated in the Sala della Lupa, Palazzo Montecitorio at a conference on "The new phenomena of armed radicalism, the use of web and strategies to combat it." 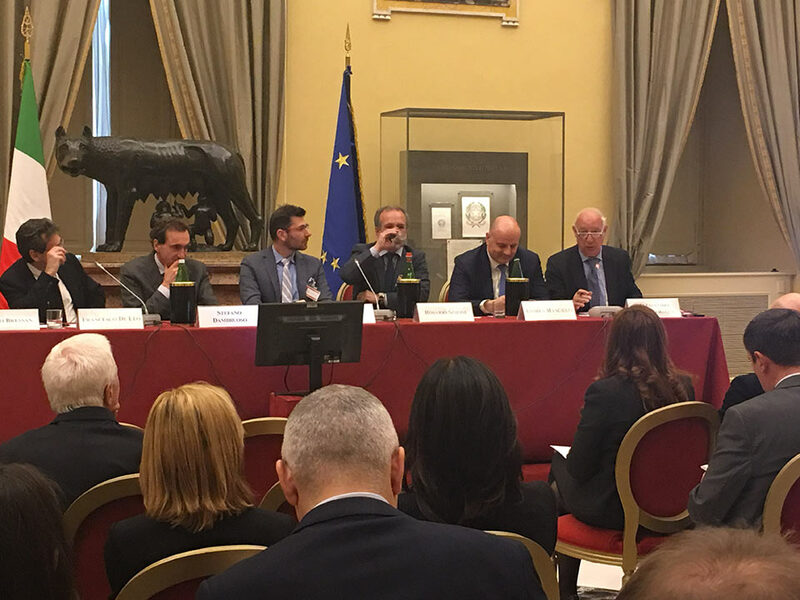 The conference was attended by the Hon.Stefano Dambruoso, Quaestor of the Chamber of Deputies; Hon. Andrea Manciulli, Chairman of the Parliamentary Delegation to the Parliamentary Assembly of NATO; Amb. Alessandro Minuto Rizzo, President of the NATO Defense College Foundation (NDCF), Dr. Matteo Bressan, analyst and member of the Scientific Committee of the NDCF, Dr. Claudio Bertolotti, Research Associate to ISPI, Dr. Domitilla Savignoni, journalist and presenter of TG5. To moderate the conference Dr. Francesco De Leo, a journalist and presenter from the transmission Transnational Space of Radio Radicale. At the center of the debate the evolution of the phenomenon of terrorism and measures to combat it. Although Al Qaeda already resorted to propaganda via Web through encrypted messages, to date 90% of the activity of ISIS terrorists takes place across all social media posting videos, photos, graphics to impress at international level, while at the local and regional level its propaganda is aimed at reassuring as bearers of stability and security in the Islamic world. Respond to this new type of terrorism with a counter-propaganda is an archaic solution. Today is fundamental public diplomacy aimed at involving local institutions and civil society, intellectual mediation of those who work on the news in order to provide correct information, but also the adaptation of defense systems that need to shift the focus on analysis from the battlefield to the darkest levels of the web. Moreover, given the global nature of the threat, it is urgent a concrete action of the Security Council, in order to monitor the post ISIS and the consequences of the return of thousands of foreign fighters in their respective countries as well as the behavior of young Muslims people who grew in ISIS ranks.